It’s hardly original to comment about Citron – 10,916 Ravelry members have made one and it’s in over 7,500 queues. 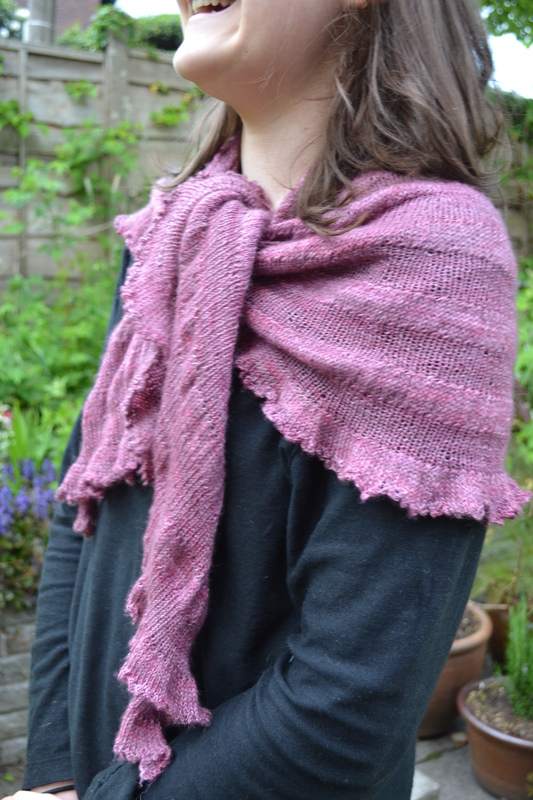 But it’s such a great little shawl, originally published on Knitty by Hilary Smith Callis. I made mine after sitting behind someone wearing one on a training course. I could hardly wait till the break to ask about it. 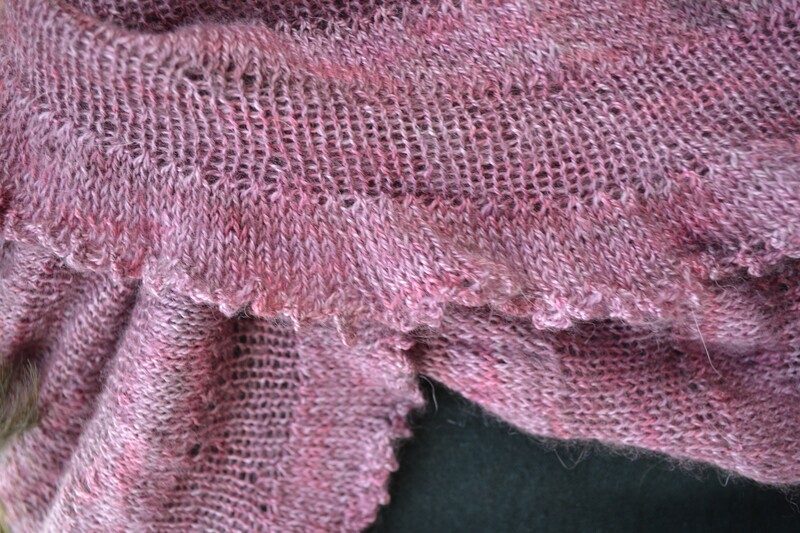 And after seeing mine my sister also made one – so it appears to be a very seductive little garment. To see it is to want it! 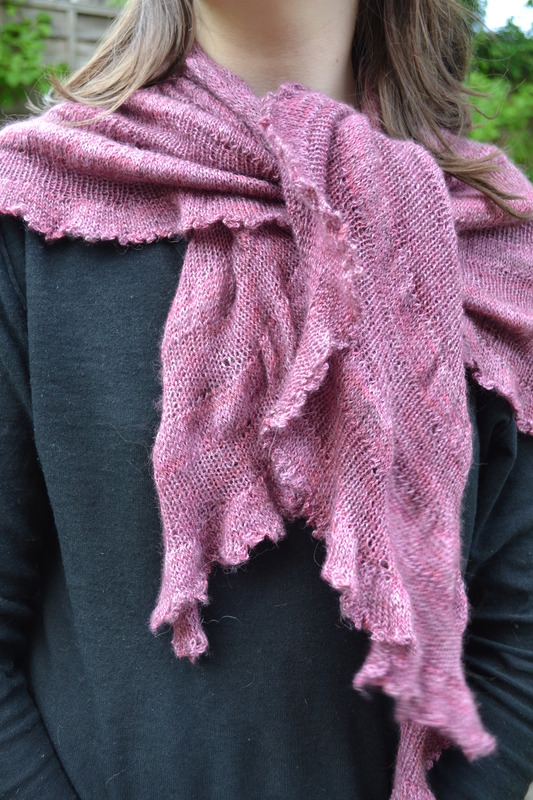 I made mine in Juno Alice Lace in a colour called ‘Pot pourri’ which is just the right name – the semi-solid soft pink puts you in mind of the china bowls of slightly dusty dried rose petals you see in English stately homes. This yarn is beautifully soft and silky so my Citron is a real comfort on chilly days. Best yet – Juno is a small British dying company based in Devon. The colours are lovely. OK, it has to be admitted that the miles of stockingette might not be to everyone’s taste but somehow it gets a bit addictive. And it’s pleasant TV knitting. Be warned that towards the end of this project the rows get VERY long! I made the mad decision to end with a picot – I didn’t calculate how many stitches this involved but it took two evenings to complete. Having done that I was pleased I had as the resulting edge does not roll the way the original design does. It’s a matter of personal taste though.